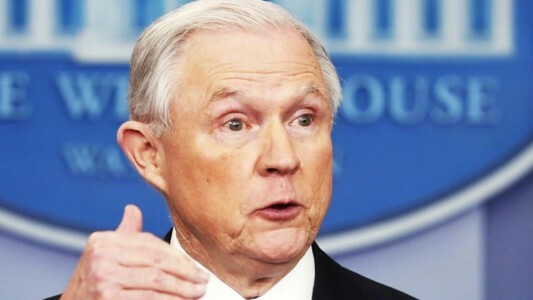 You are here: Home / A-Blog / Trump Takes a Swipe at AG Sessions After Congress Sends Criminal Referral of Hillary, Comey to DOJ. President Trump took a swipe at AWOL AG Sessions Sunday morning after Congress sent a criminal referral of Hillary Clinton and James Comey to the DOJ. Trump took a swipe at AG Sessions Sunday morning from his Twitter account. Congress criminally referred Hillary, Comey, McCabe and Lynch to the DOJ, but what good is a criminal referral if our AG is AWOL? Trump tweeted: “GOP Lawmakers asking Sessions to Investigate Comey and Hillary Clinton.” @FoxNews Good luck with that request! Rep. DeSantis and 10 other lawmakers sent a letter to the DOJ Wednesday,criminally referring Comey, Hillary Clinton, McCabe and Loretta Lynch for their investigations into Trump. The Inspector General also sent a criminal referral of McCabe to the Justice Department. On Friday, the Inspector General also opened an investigation into Comey for his classified memos. This is good news, but in order for the criminal referrals to have any real power, the Attorney General must take action!